SAN FRANCISCO: Hyundai, the company that built its reputation in America with inexpensive, basic transportation, continues to surprise car shoppers. After introducing economy sedans like the surprisingly refined Accent, sleeper sports cars like the Tiburon, and the competitive midsize Sonata, Hyundai now debuts a flagship full-size sedan in America. Welcome the XG300. The name sounds like a 1950s test rocket or a secret ingredient, but actually it is typical of today's alphanumeric nomenclature. Everybody wants their cars to sound like an upscale Mercedes, BMW or Volvo, and the XG300 fits right in. 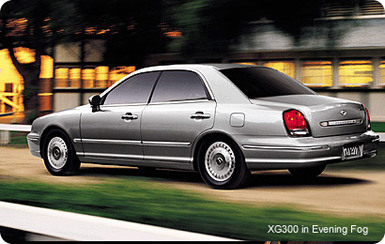 In any case, the XG300 includes practically every feature a shopper would expect in an entry-level luxury car, for a price well below its near-luxury segment competitors. And who are those competitors? They start with the top-of-the-line Toyota Camry, Honda Accord, and Nissan Maxima and move up to the territory of the Lexus ES300, Acura TL, and even the Volvo V70. The XG300 matches up well against those vehicles in size and power. That means generous front and rear legroom, plentiful trunk space, and a dual-overhead-cam V6 engine with about 200 horsepower on tap. The XG300's engine produces 192 horsepower, and fuel mileage is typical, at 19 city, 27 highway. Controlling the V6 is a Hyundai's Shiftronic five-speed automatic transmission. Getting five forward speeds in a "value-priced" car is remarkable in itself, but this one offers a second gate that enables drivers to select gears manually, a feature usually reserved for upscale European and Japanese models. The list is just beginning. The XG300 sits on a four-wheel independent suspension with double wishbones up front, with front and rear stabilizer bars to keep the car level in curves. For superior stopping power, Hyundai serves up four-wheel disc brakes with antilock and mounts Michelin V-rated tires on alloy wheels to make them stick. Inside the car, there is little to wish for. The long list begins with power windows, locks, and mirrors. The sound system features AM/FM and CD (cassette decks are on their way out). Then, there are the power driver and front passenger seats, covered in rich leather. Throw in air conditioning, cruise control, remote keyless entry, a trip computer, and heated outside mirrors and the package gets better and better. There are many other little touches, like pop-out coat hooks, an illuminated ignition keyhole, and a rear fold-down armrest with storage compartment. A couple of omissions show the downside of value pricing, however. The air conditioning was not a fully automatic climate control system and the trip computer did not include either outside temperature or fuel mileage information. Hyundai seems to have modeled the XG300 after the $60,000 Infiniti Q45. You can see it inside, in the beveled sections of artificial wood, the chrome accents, the handsome typeface on the instrument panel gauges, and the center console proportions. Outside, the oversized chrome door handles, complex and handsome alloy wheels, formal grille and the high chiseled tail all show Q45 influences. My pal Jim sees a touch of Rolls Royce in the rear styling. The XG300 is more than a list of ingredients and influences, however. Driving down the road, it is hard to connect this imposing, whisper quiet, luxuriously appointed sedan with the ill-fated Excel of the 1980s. In a 400-mile week of commuting and around-town errands, the XG300 felt strong, quiet and pleasant, like a luxury sedan should. Quality is always an issue, but Korean cars now are approaching Toyota levels of fit-and-finish. The materials appear substantial and the seams are straight. I detected no squeaks or rattles, and even the scent was unobtrusive. Color choices in the XG300 are sophisticated inside and out, mine sported midnight green paint, and the artificial wood seems real enough out of the corner of your eye. You don't get real wood in this market segment anyway. I have only a couple of minor complaints. For some reason, courtesy lighting is nonexistent in the rear seat area, although red lights on the door edges provide visibility to other drivers when the doors are opened. Also, the wavy pattern on the instrument panel gauge faces is an odd choice in my opinion.